One of the most exciting things about this Trillium is actually its mottled foliage. It's an enchanting woodland or shade garden ground cover, with striking leaves flecked with lighter hues. It slowly but reliably naturalizes—you can divide it every couple of years to increase the spread. The plant begins to grow right away at the end of winter, and then richly colored blooms appear in mid to late spring. Grows easily, as it is a North American native, and thrives especially well in a moist, shady spot. 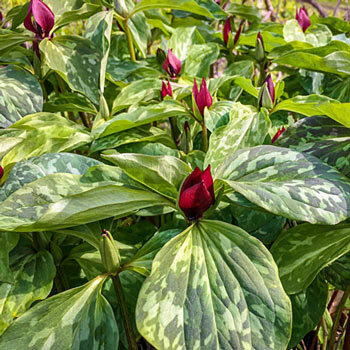 Purple Prairie Trillium combines beautifully with other spring wildflowers and ferns. Flower Form: The flower (2" high) features three erect petals of variable color (maroon to brownish purple to dark red) 3 reflexed sepals and sits on top of a set of three whorled leaves. Additional Information: A classic spring-blooming, woodland wildflower. 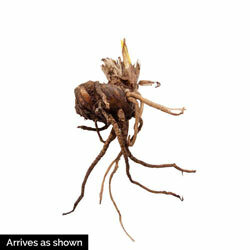 Excellent when massed in a shaded woodland garden, naturalized area or wildflower garden. Mixes well with other spring wildflowers and ferns. Not recommended for the perennial border.